This recipe is one I came up with based on Alabama white bbq sauce, specifically a twist on this clone *** of Big Bob Gibson's White BBQ Sauce. You can also buy the sauce bottled, find several other "clones" of it, or even find other white BBQ sauces. When you first look at the ingredients, your reaction will probably be like mine when I first read about white bbq sauce in Southern Living a couple of years ago. A MAYONNAISE BASED BBQ SAUCE????? Ewwwwwwww gross! I didn't even TRY a white sauce for months, just because it sounds so odd. 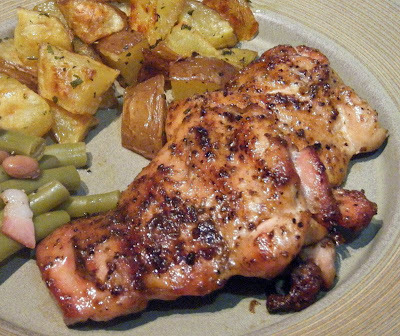 But now, this has become our favorite chicken recipe ever! It's tasty, zesty, and open to lots of variations. You do NOT taste the mayo or the vinegar. Plus it is fun to cook and entertaining for others to watch with all of the dipping and flipping! My wife swears it's the cooking the sauce onto the meat instead of just dipping it at the end that makes the difference. Set up your grill for direct heat at 350f with your cooking grate about 8" from the heat source. -Don't use liquid starters. 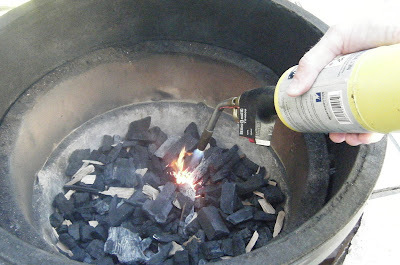 I like using a MAPP gas torch ($25 at Lowes) to start 3 areas and let it go. Chimney starters are also a great tool. (The wood used here is cherry.) -Make your thermometer easy to read. 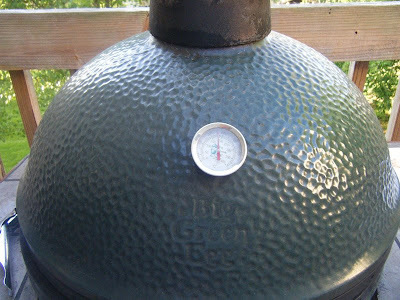 If you can spin your thermometer, rotate it so your target cooking temp is at 12 o'clock. Can you read the thermometer in this pic? Me neither but because I rotated it with the 350 mark at the top, I know it's at 350 at a glance and from a distance. Makes it easy to see quickly if you're over/under. Season your chicken with the dry rub. Mix the sauce in a blender. Divide sauce into two large bowls. Place the chicken on the cooking grate & close the lid. Two more tips. First, notice that all of the chicken thighs are same side up. This helps you keep track when "flipping and dipping" so you DON'T put the same side down twice. Second, place the thicker part of the thighs closer to the center of the heat source for even cooking. So here's the game plan. After 5 minutes, flip the chicken & close the lid. After 5 more minutes (10 minutes total), dip the chicken in bowl 1 of the sauce, flip back onto the grill & close the lid. After 5 more minutes (15 minutes total), dip the chicken in bowl 1 of the sauce, flip back onto the grill & close the lid. At this point, discard bowl 1 and change to clean set of tongs. After 5 more minutes (20 minutes total), using clean tongs dip the chicken in bowl 2, flip back onto the grill and close lid. After 5 more minutes (25 minutes total) remove the chicken and let it rest. See? It does NOT turn out dripping in some white goey sauce. You can plate it as just grilled chicken... but it also works as a chicken sandwich (with bacon, lettuce, tomato) or sliced and tossed into fettucini alfredo. ***Having spent some time with Chris Lilly of Big Bob Gibson's BBQ the weekend of May 9th, I can tell you that this is NOT a true clone of their white sauce. This recipe still works as written, but to get a true clone, buy a jar at the link already listed or buy a copy of his new book, Big Bob Gibson's BBQ Book.